Members squabble with one another, but no one wants to leave. When Venezuelan Oil Minister Juan Pablo Pérez Alfonso resigned in 1963, he blasted the Organization of Petroleum Exporting Countries, at the time torn by internal rivalries, for failing to produce any benefits for his country. 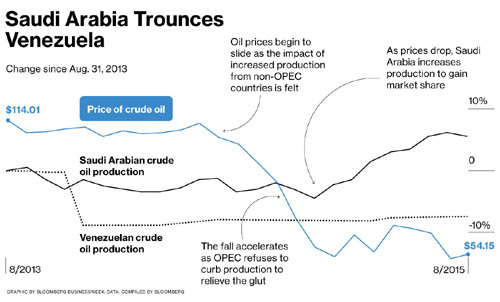 Half a century later, OPEC is still split and Venezuela is again unhappy, this time at the unwillingness of the organization's top producer, Saudi Arabia, to rescue oil prices from a six-year low that's dragging the battered Venezuelan economy into an even deeper crisis. On Sept. 10, Venezuela's oil minister, Eulogio del Pino, tweeted appeals for OPEC and non-OPEC countries “to have a discussion on fair prices, minimum prices to ensure sustainability” and to “overcome our differences of opinion.” Venezuelan President Nicolás Maduro said on Sept. 16 that he was making progress on organizing a summit of petroleum exporting countries to have that discussion. OPEC member Algeria is backing the Venezuela-proposed conference—as well as Maduro's desire for a higher price. Venezuelan officials didn't respond to requests for comment. Maduro's plans won't pan out unless Saudi Arabia stops flooding the market. There's no sign it'll retreat from that strategy, which is helping it preserve and even gain market share. “OPEC is of no use today,” says former Algerian Prime Minister Ahmed Benbitour. “The war now is about market share, not price, and Algeria is getting no benefit from this organization.” OPEC declined to comment for this story. Venezuela's and Algeria's complaints raise the question of why some members stay in OPEC if the Saudis call the shots and ignore pleas for higher prices. Neither Venezuela nor Algeria has made moves to quit. Not only is the group intact, but former member Indonesia is returning, boosting membership to 13 nations. Disgruntled members “don't leave because they still believe there could be something in the future where the group does make a decision” to boost prices and cut production, says Jamie Webster, an oil analyst at researcher IHS. “It's much easier to just keep OPEC alive than to shut it down, and with it a key communication channel” among governments whose financial health depends largely on oil income. Of the 1.7 trillion barrels that remain to be extracted worldwide, 1.2 trillion, or 70 percent, are controlled by OPEC's current members. Venezuela and Saudi Arabia hold 18 percent and 16 percent, respectively, and Iran and Iraq 9 percent each, according to oil major BP. These four nations, with Kuwait, are OPEC's founding members. “Just look at the outlook for oil in the next 10, 20, 30 years. It is expected that OPEC countries will actually have to come up with most of the growth in supply to meet the demand,” says former OPEC Secretary General Adnan Shihab-Eldin of Kuwait. “If OPEC didn't exist, it would be needed in the future much more than in the present or the past” to coordinate production and keep the world supplied. Pricing has often been a bone of contention, with Algeria, Iran, Iraq, Libya, and Venezuela pushing for higher prices, a hawkish stand compared with Saudi Arabia and its neighbors Kuwait, Qatar, and the United Arab Emirates. “Venezuela's position within OPEC is to pursue a strategy of low production and high prices, since they can't attract investments” to boost output, says Carlos Rossi, president of Caracas-based consulting firm EnergyNomics. Gulf Arabs are more inclined to accept a lower price to keep consumers hooked on cheap gasoline and thus extend the Age of Oil. Saudi Arabia in particular is more likely to accept a lower price that preserves global growth and gives it influence far in excess of its actual economy. Says Ed Morse, Citigroup Global Markets managing director: “Saudi Arabia's economy is the size of Illinois's.” Yet the nation sits at the same table as China, Europe, Japan, and the U.S. thanks to its role as the major producer. Instead of lowering output to prop up prices, as suggested by Algeria and Venezuela, Saudi Oil Minister Ali al-Naimi lobbied his OPEC counterparts in November 2014 not to yield market share to competing suppliers, including U.S. producers of shale oil. Crude sank and trades at about $50 a barrel, half its level a year ago. “What OPEC wanted to do is have a fresh look at the structural changes that have taken place in the oil market with the advent of U.S. shale and other producers, who at a very high price were able to bring in fresh supplies that far exceed what demand called for,” says Shihab-Eldin. Algeria's and Venezuela's attempts to recruit non-OPEC producers in an effort to increase prices have been rejected by Russia and Mexico, two of the largest exporters outside the group. The Mexicans say their focus is on restoring the productivity of their biggest field. Russia says it doesn't have the ability of some Persian Gulf producers to quickly raise or lower output because of the harsh winters and complex geology at its Siberian oil fields. “You cannot regulate productivity of Russian wells simply by turning a faucet,” Sergei Klubkov, exploration and production analyst at Moscow-based Vygon Consulting, said in an e-mail. The International Energy Agency says Saudi Arabia is winning the fight for market share, driving higher-cost producers—for example, some U.S. shale companies—out of business. Non-OPEC supply is expected to fall in 2016 by the most in more than two decades as producers shut wells that can't operate profitably with oil below $50 a barrel. Production outside OPEC will fall by 500,000 barrels a day, to 57.7 million, in 2016, the agency said on Sept. 11. That's no solace for those in OPEC who are hard-pressed for cash. Fresh supply is likely to hit the market from Iran next year, when the oil export ban is lifted as a result of the July agreement with the U.S. and the other Western powers restricting its nuclear program. Oil prices could drop to as low as $20 a barrel, Goldman Sachs said on Sept. 11. Saudi Arabia's production of about 10.5 million barrels a day is its highest ever, and the kingdom still has spare capacity of more than a million barrels. Other OPEC members are pumping less oil as projects to bring fresh crude to the market were derailed or delayed by political or social unrest. Venezuela is producing 2.5 million barrels a day, vs. a peak of 3.7 million in 1970. Algeria and Nigeria are in similar straits. Indonesia voluntarily suspended its OPEC membership in 2009 as its production declined to the point that it had to import oil. Indonesia still pumps oil for its domestic market. It will return officially on Dec. 4 as the first member that isn't a net oil exporter. As OPEC's only member in East Asia, Indonesia could help strengthen the group's ties in the region, where oil demand is strongest, said Indonesian Energy Minister Sudirman Said in June. 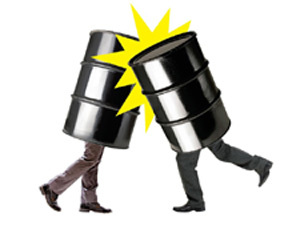 As both oil consumer and producer, it will help OPEC bridge the divide between the two groups, he said. “The benefits from staying with the group outweigh by far the cost of membership,” says Hasan Qabazard, chief executive officer of Kuwait Catalyst and former head of research at OPEC. “Getting firsthand access to market data, research, and information that may affect the market” could be “the motivation behind Indonesia's application” to return. The bottom line: Saudi Arabia manages to impose its will on other members of OPEC, thanks to its ability to flood the market. Maher Chmaytelli is Award winning journalist with extensive experience covering energy, politics and business in the Middle East, Eastern Mediterranean and Africa . Petroleumworld does not necessarily share these views. Editor's Note: This commentary was originally published by Bloomberg Businessweek, on September 24, 2015. Petroleumworld reprint this article in the interest of our readers.